Located on Leaders Heights Rd just off I-83, Extra Space Storage serves residents of York, Leaders Heights, Spry, and more. Locals will recognize our facility next to Holiday Inn Express. Are you a college student who needs a storage unit over the summer or while studying abroad? 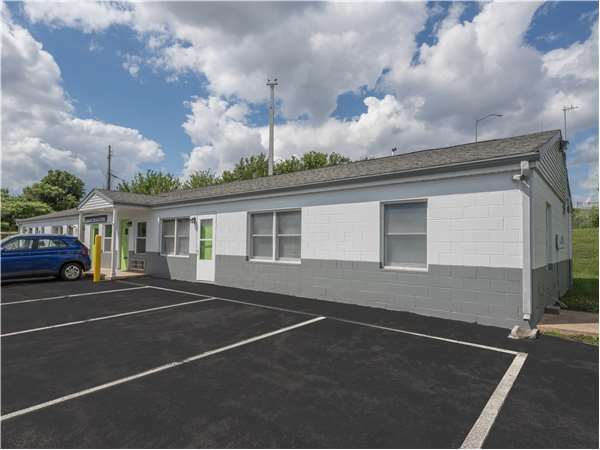 Extra Space Storage is about 3.4 miles from York College of Pennsylvania, so we're a convenient option! With a wide range of storage units, climate-controlled storage, vehicle storage, and exceptional security, Extra Space Storage on Leaders Heights Rd is the storage partner you can count on in York! Our York storage facility has units ranging in size from 3x5 to 27x20 with convenient features like first-floor access and drive-up access. We have the storage space you're looking for! With advanced security measures like an on-site resident manager, 24-hour video surveillance, and electronic gate access, you can confidently store valuable items at Extra Space Storage. For year-round protection of temperature-sensitive items, we highly recommend a storage unit with climate control. These units stay between 55? and 80? at all times, preventing damage caused by extreme cold or heat. Climate-controlled units are available in sizes 3x5 to 10x20. With 10x15 outdoor parking spaces and 10x10 to 11x30 enclosed drive-up units, Extra Space Storage has the secure vehicle storage options you want for your motorcycle, car, RV, or boat in York! With a secure, clean, well-maintained storage facility and a friendly, professional team dedicated to delivering great service, Extra Space Storage goes above and beyond to provide customers with an incredible self storage experience. Contact us today to reserve a storage unit in York! They have great customer service and when things get rough, they work with you to help you. They answer all your questions and offer as much help they can give, like giving me an extra lock from the office to better secure my unit during a tough time. I would recommend them to anyone. From the website experience to dealing with the staff at the Leaders Heights location - it couldn't have been easier. The assistant manager was absolutely awesome in assisting with getting the right unit for my needs, and her upbeat attitude was a welcome change from other customer service experiences I've had. The unit was clean as a whistle, easy to access and well lighted. My stored items will be well cared for with the climate controlled area. The monthly rental fee was reasonable and easy to setup auto-pay for during the rental process. Give Extra Storage a good look if you're looking for a reasonably priced and clean storage unit. First time using a storage unit.Chavah was excellent explaining all the details. The location of the unit is very accessible and unit is very clean. The staff is super friendly and knowledgeable. The facility is clean and in great working condition. The prices are super! I appreciated the ease and access to a website and the discount for using it. I love that after calling the 800 number, I instantly got a call from the location nearest to me to find out my ETA. When I arrived the staff was super friendly and proceeded to show me a few unit sizes with the best access that would best suit my needs. Customer service is the best ever. I refuse to go anywhere else. They found me the best options for what I needed at a price that beat all others. This was hands down the best experience we've had when dealing with our storage needs. Nothing was missed. Everything was explained. We were treated like family. From now on we wont go anywhere else when in between moving!! Awesome experience, security is the best, nice clean site. I know people who have used this company with good results. Manager was very helpful and understanding of my situation and needs. I moved out of town, when I started renting from this storage place I paid 78.00 dollars now I pay 120.00...continually goes up!!! I pay 50 a month in Wisconsin where I live now. outrageous amount!! Great location. Clean accessible units. Helpful staff. Easy entry to facility. The staff made my experience very easy and hassle free. Clean, safe and convenient. I would highly recommend the Leaders Heights location! When we put our house up for sale, we needed to clear out as much as possible from our house. ExtraSpace was affordable and conveniently located. More importantly, when time came to move to our new house, ExtraSpace was quick to close our account with no fuss. A positive experience from start to finish. This, being our first time experience at using a storage facility, we found the staff to be extremely helpful and courteous . Rental was Quick and efficient. The unit is clean and in good repair. I didn't award five stars because of the time restriction. I need a storage unit I can access 24/7. I would have had to pay for a much larger unit without climate control for full time access. Im not happy with this storage company,I only been in the unit 3 months and there raising my rent another $10.00. If they raise it again then Im out. Clean facility, friendly staff, convenient location. Absolutely the best customer service ever! Troy who waited on me was exceptional. Professional, knew about all the information I would need to complete my storage rental. This is a great storage unit. The staff is very nice and respectful, they also took the time to help me understand everything that I needed to know. The prices are great as well. They help you with what you need. I rented a unit from Extra Space Storage for approx 2 years in York, PA on Leaders Heights Rd. I found the facility to be clean and the staff personable. Recently I moved out. Every box (12) I have unpacked is filled with mold. Since the building is supposed to be climate controlled this should not have happened. Please do your research before considering renting there. Everything I have is ruined. Employees are great when your able to reach them over the phone. Being short staffed. We had a storage unit for a few yrs. And have had many stink bugs in our unit and in our boxes and belongings. Every yr there is a price increase but nothing done to treat for the stink bugs other then the employee opening a door swing the broom while taking off running in the other direction which I've seen more then one occasion being there. No leaks in the unit we've have rented. We had a great experience at our local office. Staff was helpful, friendly and knowledgeable. Very knowledgeable employees. Simple and easy sign-up process. Automatic payment is a plus. Our representative was extremely helpful and polite. I would recommend this storage facility to anyone that needs this. Thank you again! Employees are very friendly & caring. Units are clean & well maintained. We were greeted by name when we came in for our appointment & shown the unit we requested before signing the rental agreement. We appreciate that we could see it to be sure that was the size we needed. Great company! Super clean and organized facility and great staff that will answer any questions. Would recommend them to anyone! The overall experience getting my storage space was great. I wasn't rushed through the process which seems rare these days. Convenient access and hours a plus. We had a very good experience at the facility in Leaders Heights, PA. The gentleman we dealt with got back to us very quickly on the phone, invited us in, and went through everything very quickly and thoroughly. Very friendly as well. Great experience! Staff is very nice and helpful. The facility is very clean and easy to get to. I would definitely recommend this for summer college storage! Sign up was Quick and easy, great guys to deal with ! Every employee at the Leaders Heights location in York, PA has been a pleasure to deal with. Very professional and beyond helpful, especially Troy. If I need or someone I know needs a storage place I know where to send them. The staff was extremely helpful. They allowed me to view the unit prior to my scheduled move in to confirm size. Online signup went without problems. Great prices, good location and the staff were very helpful. No problems with access. Highly recommend! I had a wonderful experience with extra space. The people are very nice and very helpful. They explained every option possible for me to rent. I would highly recommend them to you!! This was a perfect place to store everything during my moving process. The customer service was excellent - always extremely helpful. I appreciated the cleanliness and security at this location. I would definitely recommend this storage facility and would not hesitate to use it again. I have used this facility since July 2013 after moving here from Florida. I have rented various sized units during that time as we settled in to our new location in Pennsylvania. The team at this facility has been outstanding in accommodating my changing space needs over the 2+ yr transition. The facility was very convenient to my location, easy access, excellent care and maintenance of the facility throughout the winter season(s), and the facility was clean and well kept. The price(s) were very affordable. I highly recommend this facility. Kevin is awesome to work with. He went above and beyond to meet my needs and really helped me out. I would definitely recommend this facility to others!! Very clean and courteous employees. Fast response to online orders. We have used this facility before and now need storage again... There was never any other choice to make. Very pleased with facility and the folks that work there. Very helpful, very friendly. When I first moved back to Pa. I needed to store my household items and being able to return the rental truck and move my items into a storage unit with people that I had dealt with before was great. The facility has always been clean, secure and close to where my family lived so that it even made it convenient that if I needed to have my daughter or son in law come up and check on something for me it wasn't out of their way. Well we are being relocated again, and that is the only reason for moving my things so soon. Keep up the service you guys are the best!! The center on Leader Heights Road has been fabulous and convenient. They facility is very nice, clean and accessible. This facility had the size unit we needed and it was very clean and reasonably priced. The auto pay option also made it very convenient for me. The facility was in a great location for security and was very accessible. I would definitly recommend using this facility for your storage needs. Most storage facilities are similar in what they provide. What sets Extra Space apart is the quality and service of their employees. Convenient, prices competitive. Had exactly what we needed. Great staff. The customer service at Extra Space Storage in York has been, since the start of my renting space there, excellent. The staff is always friendly and ready to assist in whatever way they can. I like the convenience and being an older woman, I feel safe going to this facility. Plus the staff is great and the place is kept clean. I REALLY LIKE EXTRA SPACE STORAGE...THEY HAVE GREAT CUSTOMER SERVICE, THE PLACE IS CLEAN AND WELL MAINTAINED AND I DON'T FEEL I NEED TO WORRY ABOUT MY STUFF BEING STORED THERE! I'VE USED OTHER STORAGE PLACES AND I'VE HAD THE BEST EXPERIENCE OUT OF ALL OF THEM WHILE AT THIS FACILITY! The people at Extra Space Storage are always friendly and have always been understanding and helpful. They live up to your expectations of how a reputable company should be! Their customer service is exceptional and I wouldn't even consider going somewhere else for my storage needs. Customer service is outstanding with great employees. The gate is frequently out of order, and when that occurs, the secondary entrance is left open--i.e. unsecured. Access hours are generous--but limited--i.e. not 24/7. Drive south on I-83 S. Take Exit 14 and keep right. Turn right onto Leader Heights Rd. Turn left onto Pine Grove Rd. Turn left onto Pine Grove Cir. Our facility will be at the end of the road. Drive north on I-83 S. Take Exit 14 and keep left. Turn left onto Leader Heights Rd. Turn left onto Pine Grove Rd. Turn left onto Pine Grove Cir. Our facility will be at the end of the road. Drive west on Leader Heights Rd. Pass I-83 and continue west. Turn left onto Pine Grove Rd. Turn left onto Pine Grove Cir. Our facility will be at the end of the road. Drive east on Leader Heights Rd. Pass Leaders Heights Elementary School and continue east. Turn right onto Pine Grove Rd. Turn left onto Pine Grove Cir. Our facility will be at the end of the road.